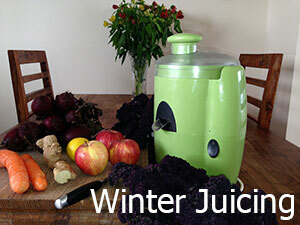 Juicing is a fun and popular way for people to get more variation and nutrition in their diet. It is considered to be a means of unlocking a food’s true potential, freeing up nutrients that would otherwise remain locked away in the plant’s indigestible cellulose. Nearly any fruit or vegetable can be juiced in order to unleash all of its goodness, but juices made from fresh colourful vegetables are considered the best options by far due to their low sugar content and variety of vitamins and minerals. At this time of the year the beautifully vibrant beetroot and kale are appearing all over at supermarkets, grocers and farmers markets and juicing them down is a great way to add them into your diet. These superfood veggies in particular are thought to protect the liver, help to detox and purify the blood, and contain high levels of antioxidants which repair damage to our cells and strengthen our immune systems. 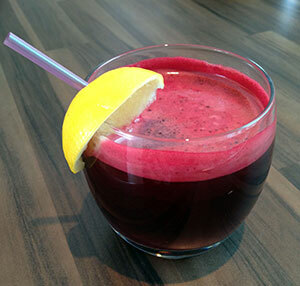 Juice all the ingredients except for the lemon which you can squeeze in after, give it a stir and enjoy!